Methyl ester produced from pimaric acid. Used For: The herb is known to induce urination, constrict the peripheral vessels, calm the nervous system, treat coughs, and act as an astringent. Bugleweed is especially applied for thyroid gland hyperactivity, when it’s accompanied with shaking, palpitation and hard breathing. It can be reliably applied in case of tachycardia induced by nervous conditions and anxiety. 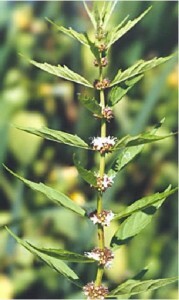 Bugleweed is applied for stimulating heart activity, decreased by water retention in the organism. The herb is additionally applied for irritating coughs, particularly those associated with nervous conditions. Additional Info: The herb is indigenous to Europe and the eastern areas of the US, where its different varieties are found, L. europaeus and L. virginicus respectively. Bugleweed belongs to perennials and may reach 12 inches in height. Its twigs feature leaf rosettes, and the plant itself looks as a carpet. The upper leaves are oval or elliptical, with the lower leaves being shaped like spatula. The plant blossoms from late autumn to midsummer, and features purple and blue flowers. Preparation and Intake: To make an infusion take one teaspoon of dry extract and fill it up with 250 ml of boiling water. Steep it for ten-fifteen minutes. The result is taken thrice a day. Commonly mixed with: To aid the nervous system Bugleweed is mixed with Valerian or Skullcap.